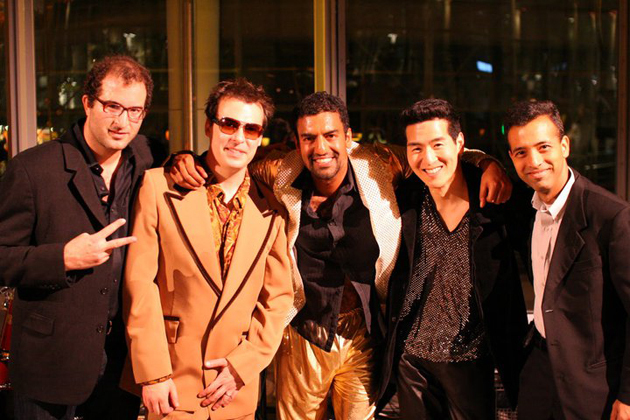 Many of you may know Blippy’s Philip Kaplan, but many of you may not know that Blippy’s Philip Kaplan (Drums) is in a boy band with Mayfield Fund VC Raj Kapoor (Vocals/Gold pants), Investor Tim Chang (Bass), Facebook’s Ethan Beard (Guitar) and Prashant Fuloria (Guitar). If you are just learning this now now, don’t fret. There’s still opportunity to familiarize yourselves with the smooth stylings of entrepreneur side-project Cover Flow (there’s nothing dorkier than being named after an iTunes interface). The nerd fivesome met each other through “business” according to Kaplan, and mostly play songs from the ’80s and ’90s, with some Lady Gaga mixed in. Really. Kaplan tells TechCrunch that band’s pretty nervous about playing the Media Temple Disrupt Party tomorrow night at Manor West, especially when going up against the star power of MC Hammer at the Google Ventures/SV Angel party on Tuesday, in a battle to win over the ears, hearts and minds of Silicon Valley. Perhaps the only band whose members correspond to Crunchbase profiles, here they are playing Nirvana’s “Smells Like Teen Spirit” below.